SSC Eastern Region Recruitment 2017 Notification released. The candidates can refer the Staff Selection Commission ER Notification 2017 @ www.sscer.org for eligibility. 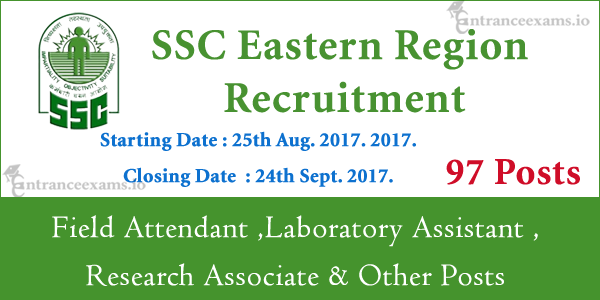 Aspirants who satisfy the eligibility criteria are invited to apply online for Eastern Region SSC Recruitment 2017. Know more about the SSCER Vacancy 2017 in the below sections. Here is the good news for the aspirants who are looking for the Central Govt Jobs. The Staff Selection Commission has released the notification for filling 97 vacancies in the Eastern Region. Hence, individuals who are interested and willing to apply for the SSCER Assistant Jobs 2017 can check the eligibility before applying. As per the official notification, the postulants whose age between 18 to 30 years are mostly invited to participate in the SSC Eastern Region Recruitment 2017. And, candidates who possess Matriculation and Bachelor of Science can apply for the Staff Selection Commission Eastern Region Vacancy 2017. Contenders can register to the SSCER Recruitment 2017 through online at www.sscer.org. We have mentioned all the important information of the Assistant Jobs in Staff Selection Commission on this page. Hence, go through the below sections for the selection procedure, pay scale, etc. For Field Attendant Posts: Aspirants should possess Matriculation or its equivalent with science subjects from the recognized Board. For Laboratory Assistant Posts: Candidates have to complete Bachelor of Science with Chemistry as one of the main subjects. Refer the post wise qualification details in the SSC Eastern Region Notification 2017. The postulants whose age between 18 to 30 years is eligible to apply for the SSCER Vacancy 2017. Candidates are informed to refer the official notification for the detailed age limitation according to the post. The Staff Selection Commission will pay the best salary to the candidates as per the post they are selected. The basic salary payable by the board is Rs. 9300 – 34800/- plus grade pay and other allowances. Refer the official SSCER Notification 2017 for the post wise pay scale. For General and OBC aspirants – Rs.100/-. For SC/ST/Female candidates – No fee. The contenders have to pay the application fee through SBI Net Banking/credit cards/debit cards or through SBI Challan. First of all, visit the official web portal i.e., www.sscer.org. Else, click on the direct link provided below. Read the SSC Group B, C Recruitment 2017 Notification available on the homepage. If the eligibility is satisfied, click on the SSC ER Recruitment 2017 Apply Online link. Enter all your information in the online application. Upload your scanned photograph and signature within the mentioned dimensions. Download and take one copy of the SSCER Recruitment 2017 Online Application. You have to send the application form to the following postal address. Hope, we provide the complete details of the SSC Eastern Region Recruitment 2017. If you need any other info, please refer the official Eastern Region, SSC Group B/C Notification 2017. Keep in touch with this www.entranceexams.io website for the latest Staff Selection Commission Vacancy.